Sew much fun challenge: use a sewing related item. I decided that a quilt card would be perfect for this challenge. I started by cutting the design from three patterned papers and one solid blue then pieced them together in the desired pattern. The quilt square was then layered on red cardstock before positioning it on a blue cardfront. A sentiment was embossed across the lower portion of the card. As a final touch a button was added to the center of the quilt square. Hi Amy ~ Your 'quilt' is absolutely beautiful. The DSP is perfect and I like the button tying it all together for our challenge this week. Thanks so much for playing along over at The Paper Players this week! Gorgeous! Those dark tones make for a stunning quilt, in much less time than a real one, right?! Anyone would love to receive this beauty! 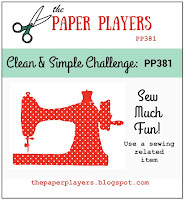 Thanks for sharing this at the Paper Players and my challenge this week! This is really stunning! 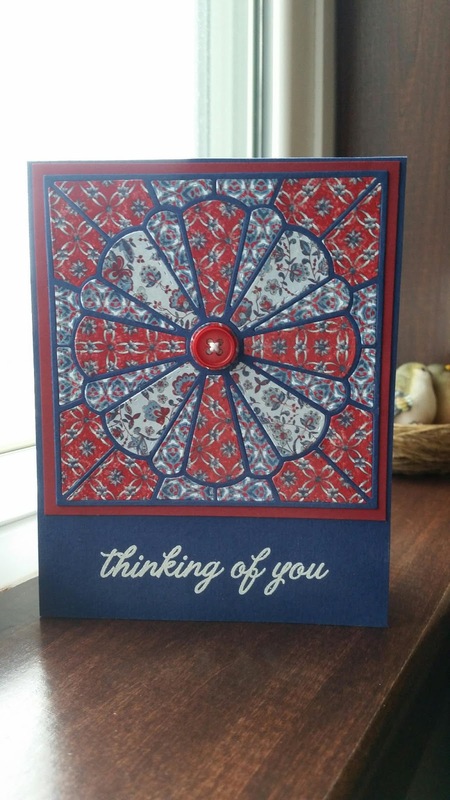 I love that patterned paper and Americana is very fitting with the name and the style of your card! Lovely! Gorgeous quilt! Wow! Thanks so much for joining us at the Paper Players!